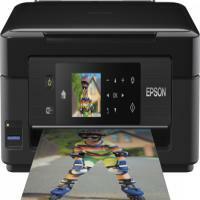 XP-432 printer from Epson looks promising when there is a requirement for a small and smart inkjet MFP for home usage. Right from the basic functions of print, scan and copy, one can perform all complex functions. For example, it can be shared among several users and or use various mobile functions and cloud services with the help of a wireless network. XP-432 printer has maximum print resolution of 5,760 x 1,440 dpi and maximum optical scan resolution of 1,200 x 2,400 dpi. It consists of a colour screen on which the images can be previewed from an inserted SD card. Also they can be printed and new images can be directly inserted in the SD card. It has a weight of 4.2 kg and measurement of 390 x 300 x 145 mm and can print A4 size as well as legal size papers. The installer configures the computer to use the card reader. It has a flatbed scanner on top and a paper tray at the bottom. The control panel has a 6.8 cm display along with the navigation buttons. Maximum number of coloured Epson XP-432 Ink Cartridges available are four in number. The XP-432 has somewhat good quality results. But the black text in it is bold and crisp while colour graphics are strong. It has a very high scan quality with an accurate colour range. If one is not in too much of a hurry, XP-432 isn't bad at all as it could benefit from lower Epson XP-432 Ink Cartridges cost. Overall it is a good printer and can prove cheaper to run and is good for using it at home. How to improve the poor print quality of Epson XP-432 printer? Q. Do compatible Epson XP-432 ink cartridges that you supply have latest version chips installed in them? If they are, can I install the cartridges directly into the printer? A. Yes, our compatible ink cartridges are ready to use and have the latest version chip installed. Yes, you can install the ink cartridges directly into your printer and use them. Q. Is it okay to take a printout on a wet paper? A. No, please avoid taking printouts on wet paper as it will yield faded prints. Moreover inserting wet paper in a printer is also not advisable for its good. Q. I installed Epson XP-432 ink cartridges about two months back but I’ve printed only twice so far. For how long will these cartridges remain in good condition and fit for use? A. These Epson ink cartridges normally last up to six months after they are opened so you have approximately three more months to use them. Q. How many pages does compatible Epson XP-432 ink cartridge (black) print? A. The black ink cartridge of these Epson compatibles set prints up to 470 pages. Q. I’d like to know the benefits and deals that you offer to buyers on your site… I’ve been using original Epson XP-432 ink cartridges but they are turning out very costly, so I’m considering compatibles. Please help. A. We offer top-quality compatible ink and toner cartridges and the most attractive offers and benefits to our valued customers. Our products are priced most competently and come with exclusive benefits and services like money back guarantee, quality certifications, ever-helpful customer support. We also guarantee hassle-free and easy returns and exchange options, fast delivery and prompt support regarding the installation of cartridges or anything you need assistance with. Q. Can I use Epson XP-432 ink cartridges in Epson XP-335 printer? A. Yes, you can use these Epson cartridges in Epson XP-335. Q. I have never used a compatible or a remanufactured Epson XP-432 ink cartridges so far. But as I found out that the price of compatible cartridges is impressively low I would like to try using it once. Can you give me a guarantee that compatible ink cartridges will not harm my printer in anyway? A. Thank you for the question. Let me inform you that the compatible or remanufactured Epson XP-432 ink cartridges offered on our website are of premium quality and provide excellent results just like the original Epson cartridges. These cartridges do not harm the printer in anyway unless handled carefully following the standard rules. We have a huge customer base that is happy and satisfied with our products. You can check the customer reviews here - https://printerinkcartridges.ie/epson-29xl-t2996-ink-cartridges-multipack. Q. The Epson Scan application is not working after I upgraded my operating system to Windows 10. Could you please help? Thanks. A. Sure. Epson Scan fails to work when you upgrade the operating system from Windows 7, 8, 8.1 to Windows 10 (32bit or 64bit). First of all, please check if Epson Scan is running in compatibility mode. Next, try to reinstall the Epson Scan application after uninstalling. Lastly, ensure that the WIA services are running. In case you need more details regarding how to perform the steps mentioned above, please visit Epson Support site. Q. What all things can I find when I buy Epson XP-432? Do I require buying anything separately? A. On the purchase of Epson XP-432 small-in-one following things are provided in the box: Individual Epson XP-432 ink cartridges, the main unit, a power cable, a setup guide, a software CD for driver and software installations and a warranty document. You just need to buy papers to start with printing. All other basic requirements are provided with the product. Q. The size of the compatible cartridges that I received for my Epson XP-432 printer looks different from the ones I ordered and do not fit in the printer. A. The size and design of the compatible Epson XP-432 ink cartridges are such that it fits within your printer in the best way. Follow the proper steps to replace and install the cartridges and make sure that the cartridges are properly locked in the cartridge holder. If the cartridges are not holding the right place in the printer then there might be a possibility that you ordered wrong cartridges for your printer. Please check for the compatibility of the cartridges and get your cartridges exchanged. Q. I am planning to buy cartridges for my Epson XP-432 printer. What will happen if I do not receive my order? A. In case you place your order for Epson XP-432 ink cartridges and you do not receive it we will cancel the order and refund your payment or you can place the order again. Q. The print quality from my Epson XP-432 printer did not improve for my printer even after print head alignment. How to resolve it? A. Check for the status of ink in your Epson XP-432 ink cartridges. If the cartridges are running out of ink then the printer might face difficulty in proper print head alignment. Also, disable bidirectional or high-speed printing as the printer moves in both the directions and vertical lines may be misaligned. Follow the steps below to disable bidirectional printing. Q. The documents that are copied from Epson XP-432 are poor in quality and have faint colors. Q. How can I order printer cartridges for Epson XP-432 printer in bulk? A. You can contact our live support team on our toll-free number to buy Epson XP-432 ink cartridges in bulk. Q. How to print in an economic way using Epson XP-432 printer? It is advised to check the cost of cartridges available for the printer rather than checking the price of the printer. As the companies make money out of selling printer cartridges and not by selling the printers.